This writing sample was created by a four year old named Kella. When asked what she wrote, the author said "Mom. Dad. Erin. Kella." 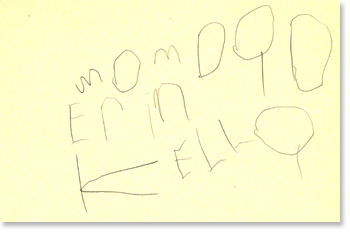 The four words in this writing sample are important sight words for this child: Mom, Dad, Erin (her sister), and Kella (her name). Continue to offer prompts or encouragement to keep this young writer interested in writing. Read finished works out loud and encourage illustrations. The conversations you have about things that interest your writer will give him more to write about. 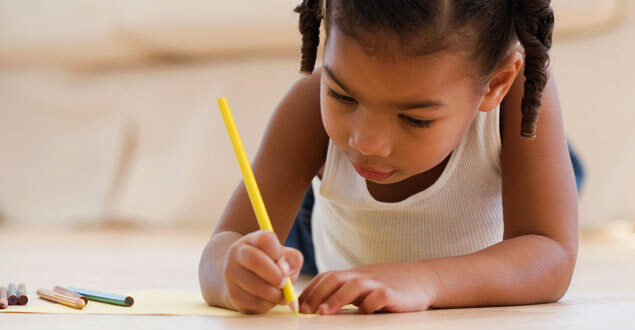 Let your child see you writing lists, letters and forms. Have a variety of materials on hand (pens, pencils, note cards, envelopes). Continue to provide your budding writer with experiences that give him or her something to write about. Trips to the park, post office, and grocery store provide real-life experiences that can be recorded by a new writer.